What's a "helperless" mama got to do without online shopping and online banking? Eversince I became a mom, I've been relying on online shopping for my apparel and some baby stuff because I just find it difficult to go around malls and shop (especially clothes and shoes) with a baby in tow. I usually buy from Facebook sellers and I learned about Shopee.ph through them. I recently gave it a try and so far I have nothing against this social marketplace. Actually, I have five reasons why I think Shopee is a great shopping site. Your money is guaranteed safe since you will be paying through Shopee, not directly to the seller. Shopee will only release the payment to the seller when you mark your order received once you receive it. Many sellers offer free shipping for orders Php 500 and above and 50% off shipping cost for orders Php 250 above. There are various modes of payment available - cash on delivery (COD), remittance/payment centers (Palawan Pawnshop, etc), over-the-counter on Shopee supported banks and online transfer. The seller/shop is rated/reviewed by the buyers thus giving you an idea what kind of seller you will be dealing with. While I love Shopee, there are a couple of things that I think may deter other buyers from using the marketplace. For every mother with a child who uses diapers on a daily basis, a diaper rash cream is very important. In our case, I've been applying it to my son's bum and thighs before putting on his diaper, particularly the disposable one. That's what the pediatrician ordered before discharging us when I gave birth to him. One of the products she recommended is zinc oxide. 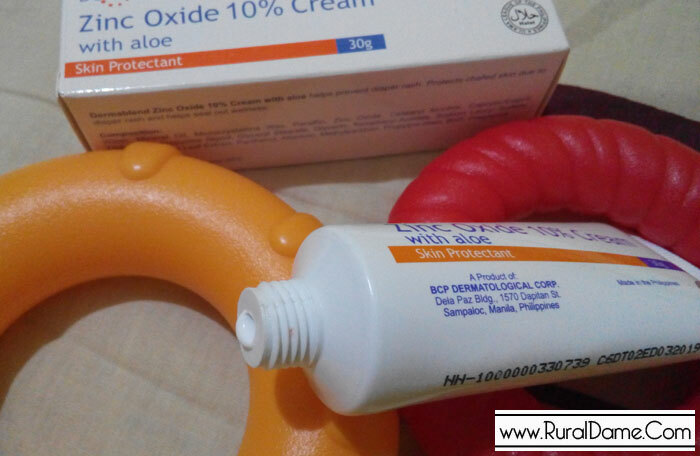 There are various brands of zinc oxide in the market but I got this Dermablend Zinc Oxide 10% Cream with Aloe since It is also the same product my nephew (a year older than my son) uses and they've nothing but good words for it. Dermablend Zinc Oxide 10% Cream with aloe helps prevent diaper rash. Protects chafed skin due to diaper rash and helps seal out wetness. Packaging and Appeal. The product comes in a white plastic tube with screw cap. The cream itself is white with just the right consistency. It is a bit thicker than the Nivea Body Lotion thus easy to apply. It doesn't leave an oily feeling either.